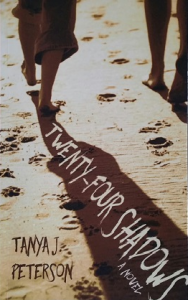 When Tanya J. Peterson contacted me about reading her new novel, published in 2016, Twenty-Four Shadows, I suspected that I'd become absorbed in another intense story. 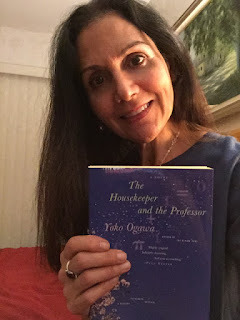 I've read other books by this very gifted author and educator, namely, Losing Elizabeth (2012) Leave of Absence (2013), and My Life in a Nutshell (2014), and each has kept me riveted. Set in Portland, Oregon, Twenty-Four Shadows is written in the third person but focuses on the life of Isaac Bittman, his wife, Reese, and their 5-year-old son, Dominic. Max, the Bittman family's good friend, and his 10-month-old daughter, Elise, are also important characters in the story. A young and devoted husband and father, Isaac suffers from recurring, debilitating headaches, and his memory lapses and bizarre behavior are getting harder to conceal from others. Early in the book, he exhibits out-of-control, out-of-character, angry behavior toward Max's wife, Gretchen. A bit later, Reese catches him puffing on cigarettes in the garage (even though he's a non-smoker). Shortly after this, Isaac loses his job--because he's missed too many days of work--and then goes missing for a while. This marks a turning point in the story: Isaac's mental illness has begun to affect the entire family. "Isaac felt sick. What had he done? What stupid thing did he do to get himself into this mess and hurt everyone so much?" Twenty-Four Shadows realistically depicts the thoughts of a caring but confused man who suffers from a mysterious, difficult, and daunting mental illness. Gradually in this book, readers meet some of Isaac's "shadows" or alters. He has twenty-four of them, male and female, young and old, with distinct personalities. Isaac learns that he has a specific mental illness called dissociative identity disorder (DID). I found this book to be exceptional because it depicts the life of a man afflicted by DID, and features his alters--June, Isaiah, Ishmael, Alton, Archer, Jake, and others--as characters with unique voices, traits, and coping skills (some are protective, like June, while others are destructive and cause self-harm, which is rather frightening). I've never read a book like this before! It gave me a better understanding of how mental illness could affect a person and his or her family. The characters are wonderfully drawn and complex; I rooted for Isaac (and his alters), Reese, Max, Dominic, and Elise. I felt a great deal of empathy for these characters, who were going through difficult times, each in their own way. Reese is a helpful, supportive, and loving wife, and Isaac loves Reese and Dominic deeply, but finds it harder to love himself (in fact, he's filled with self-loathing). Twenty-Four Shadows is genuinely fascinating; it's emotional and impactful as well. It makes you think about how difficult this mental illness would be to live with. Fortunately, though, there is treatment available. In the book, Isaac goes to a DID specialty program at the Columbia Health and Healing Center, where he gets help from Dr. Charlie and Susanna Horton, a psychologist. Previously, Isaac had always blamed and berated himself for his bad feelings; now he will learn how to deal with his illness (which was caused by a childhood trauma), including the voices he hears in his head, and his alters. There is hope for Isaac and his family, and for others afflicted by this disorder. Twenty-Four Shadows held my attention from start to finish. Peterson is a wonderful, skillful writer who brings her characters to life in a seemingly effortless manner. I highly recommend this well-written and hopeful novel. Twenty-Four Shadows is completely compelling. Special thanks to the author for graciously sending me a copy of her new novel. Thanks for reading! Comments are welcomed, as always. This is the third time I've participated in The First Book of the Year, hosted by Sheila from Book Journey. What is your first book of 2017?